What excites you the most about your baitcasting trip? If you’re like most people, the mere thought of bringing home a bigger catch would get you excited. Fortunately, that’s what the best baitcasting rod under 100 would help you do. But wait, what’s the best unit that you can find within that budget range? Well, look no further. Here’s a look at some incredible options worth pondering upon. Before we get started, here’s a brief table to give you a quick overview of the different types of rods reviewed. This is meant to help you make an accurate, and informed decision. Shakespeare never disappoints when it comes to the creation of award-winning fishing gear. Indeed, their Ugly Stick brand stands out with its durability and dependability. That’s probably a statement of the ideals that the larger Shakespeare brand rides on. 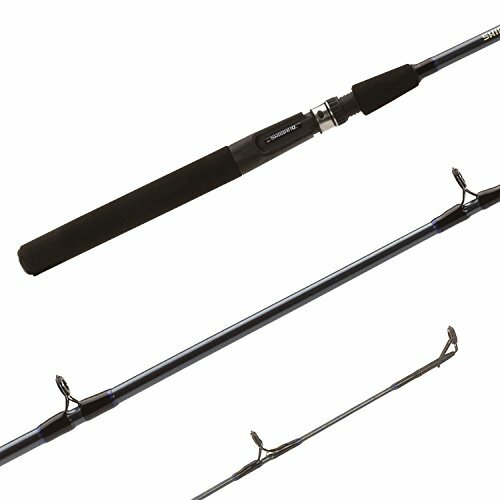 A closer look at this rod reveals that it comes with a wide variety of configurations. Indeed, you can comfortably use it even in saltwater. Besides that, it comes with a clear tip design which does a long way in extending its life. On top of that, this rod is designed to incorporate fiberglass and graphite parts for a clear matte finish. Its rugged design makes it a perfect choice even on an extremely windy day. And best of all, we tend to think that it’s affordably priced. If there’s one brand that’s synonymous with value and quality, it has to be Falcon. For many years, the company has carved a niche for itself with the ability to produce highly valued rods. 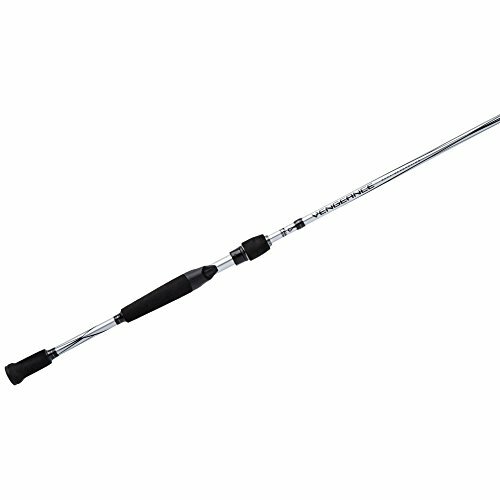 One awesome attribute of the Falcon HD rod is that it is pretty light in weight. That means you can use it to cast all day without worrying about hand fatigue. Whether you’re planning to use wake baits of big crankbaits, you’ll be sure to find this rod quite friendly. And besides that, its 100% graphite blank makes it a reliable choice, any day. Above all, this rod comes with 9 Fuji guides for a smooth, no-filler design. Last but not least, its reel seat and cork grip make it an awesome choice even for beginner anglers. The Vengeance from Abu Garcia may not come with the flashy components found on expensive rods, but it’s certainly worth its weight in gold. To begin with, it has got a pretty good backbone and tends to perform well with crankbaits. It also, generally, feels fairly balanced. The only issue we could pick with it is that its tip feels quite heavy. So, if you’re looking for the lightest rod in the park, you might want to look elsewhere. But even then, the Vengeance loads perfectly either when a fish bites or during a back cast. And most importantly, the unit has a nice, spongy feel which means it can put up with intensive demands. As you know, when a rod is too stiff, it might easily give in to pressure especially when one is fighting a feisty bass. Luckily, this one is made tough so it can withstand fights without yanking any trebles from the bass. The Torrent baitcasting rod from Piscifun is pretty versatile and that’s why we’d specifically like to recommend it for beginners. Its well-made tip is specifically made to provide a great deal of sensitivity. This enhanced level of sensitivity makes it perfect for detecting faint nibbles even in ice cold conditions. Another thing we liked about this rod is that it’s pretty light in weight. On top of that, it features an EVA grip which provides you with a handy, firm and comfortable grip. Small qualms with the otherwise perfect rod would be that it has a two-piece design. This makes it susceptible to breakage if one is faced by an aggressive catch. Featuring an aero glass blank, the FXC 2 stands tall with its all-terrain design. Indeed, the material used to make it is pretty powerful and can easily be used to lug heavy fish. The FXC 2 also comes across as a fast action, heavy power rod. It’s also sensitive and also highly durable. And the icing on the cake is that this unit also comes with reinforced aluminum guides. Those are specifically meant to allow for a smooth flow of the line for a seamless retrieval. Needless to say, this rod comes with corrosion-resistant parts and is, therefore, ideal for saltwater use. So you can fully bank on this unit to provide you with the kind of support you need for your prolonged angling forays. The Super Cat line of rods from Rippin Lips is renowned for its consistency. 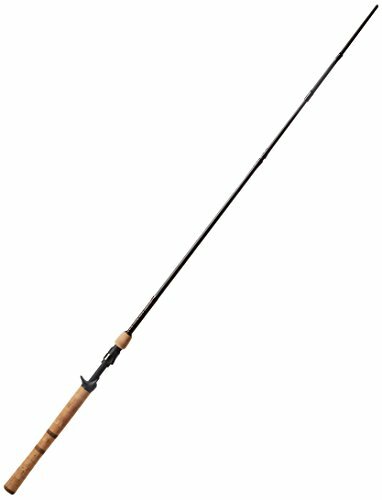 Available in heavy, medium-heavy, and medium variants, the rod comes across as a reliable bet for all styles of fishing. We particularly were drawn to it thanks to its S-Glass blanks which ordinarily tend to be lighter than E-Glass blanks. 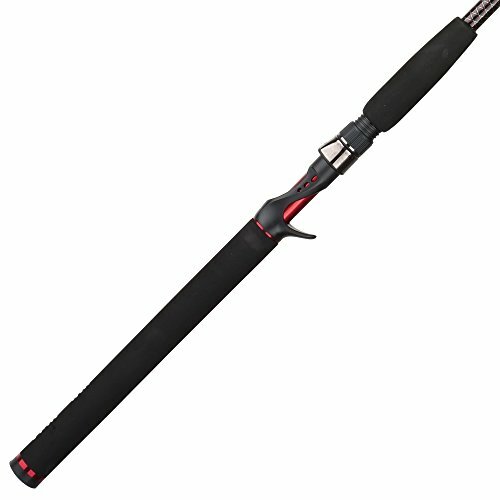 This unique design makes the rod easier to use even on a busy day out there in the waters. Its components are generally of high-quality which means you can use it sparingly for saltwater fishing. On the flipside, though, there are no bells and whistles here. But what would you expect from one of the cheapest baitcasting rods on the market? Yet another baitcasting rod from UglyStik to make it to this list is this one christened the “Elite.” The rod has been made using a different kind of technology which makes it virtually indestructible. It’s, therefore, safe to say that this is one of the few budget baitcasting rods that tick all the right industry standard boxes. In particular, this rod comes with a well-rounded reel nest which comes in handy in providing a smooth action. Therefore, you can confidently use this unit to face anything from tiny fish to the moderately big ones. So, you want to get a good baitcasting without breaking the bank? Well, the good news is that the markets always have something for everyone. But just to make sure you’re getting your money’s worth, these are the pointers we’d like you to keep in mind. You can always choose between fiberglass and graphite. Fiberglass is quite popular for being durable and resilient. Graphite, on the other hand, is famed for being strong and flexible. Not sure which one of the two to settle for? The good news is that there are some rods which feature both materials. And that means you can always get the benefits of the two in one rod. Just because you’re interested in a low price rod doesn’t mean you have to compromise on power. This is particularly an important point to consider if you’re planning to go for extra-heavy fish. Some examples of heavy fish include salmon, snook, tuna, and pike. For bass fishing, we’d recommend settling for a medium or medium-heavy rod. Bluegill, panfish, and crappie would, however, be best hunted using the smooth, ultra-light rods. 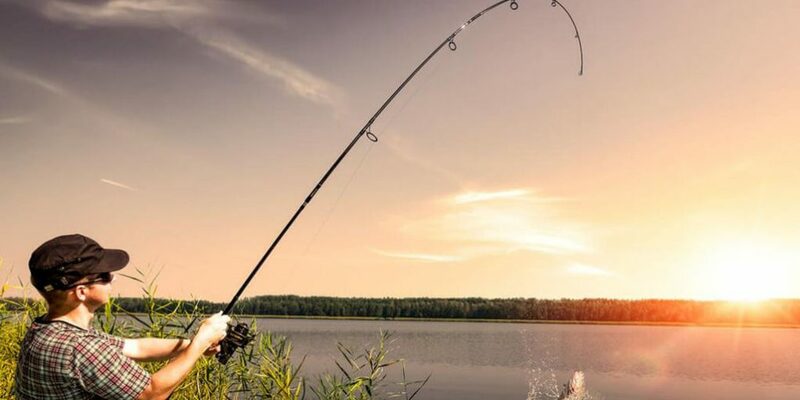 Fishing involves spending long hours in the water – and that can get a bit too tiring. For that reason, we do recommend going for a rod that’s ergonomically designed. Ideally, it should have a convenient handle – e.g. an EVA grip handle. Besides that, you want your rod to be light in weight yet powerful enough to handle extra weight demands when the need arises. No rod is perfect and, therefore, we’d like to particularly focus on one that presents you with the best bang for your bucks. This one would have to be the UglyStik GX2 Casting Rod. It’s no coincidence that it also featured highly on the review above. The rod features a combination of fiberglass and graphite which makes it an all-around unit. Most importantly, it’s highly sensitive, ergonomically designed and durable. So, we think it’s a really good rod for the money. Don’t cut corners. Much as you’d like to do anything to get a reasonably priced baitcasting rod, always be on the lookout for insanely cheap deals. Look even closer, like you’ve done by reading the reviews above, and you’re bound to discover some incredible options just a few clicks away!